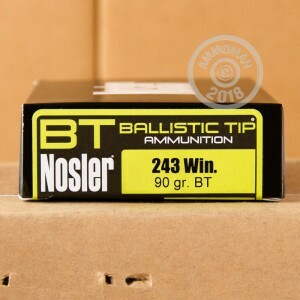 Here is another top-of-the-line round from Nosler. This 243 Winchester round has a 90 grain bullet with a polymer tip. The polymer tip on this round helps the round fly straighter, increasing its ballistic co-efficient. But that is not its only job; the polymer tip also initiates rapid expansion of the bullet, causing an incredible amount of damage in a very short amount of time. This round will cause a faster kill on game that you would typically use a 243 Win on, as compared to FMJ's soft points and regular hollow points. This ammo has a reloadable brass case, is Boxer-primed, and is non-corrosive. Nosler was formed in 1948, and is a family-owned company located in Oregon. 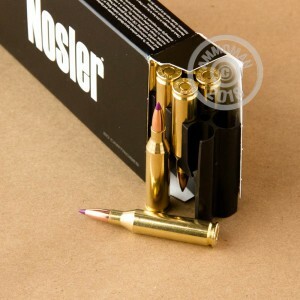 Nosler is a smaller company, as compared to the big three in ammunition manufacturing. 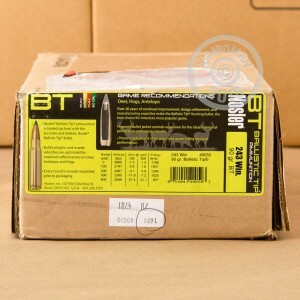 However, they have had their fair share of innovations, including the Nosler Partition bullet and Ballistic Tip bullets. Order enough of this premium ammunition to last you all season, because it may not be in stock for long.